The Hospitality Industry is a mammoth of industry and one of the fastest growing one. In this post, we have listed Hospitality career paths and types of jobs in the hospitality industry. We have tried to cover most of the hospitality industry jobs and have ensured that there are enough resources and further reading for those who want to investigate the topic further. Discussing Hospitality careers is no easy task because of the expanse of the hospitality industry. We have made this post cover only the key points while discussing hospitality career paths. 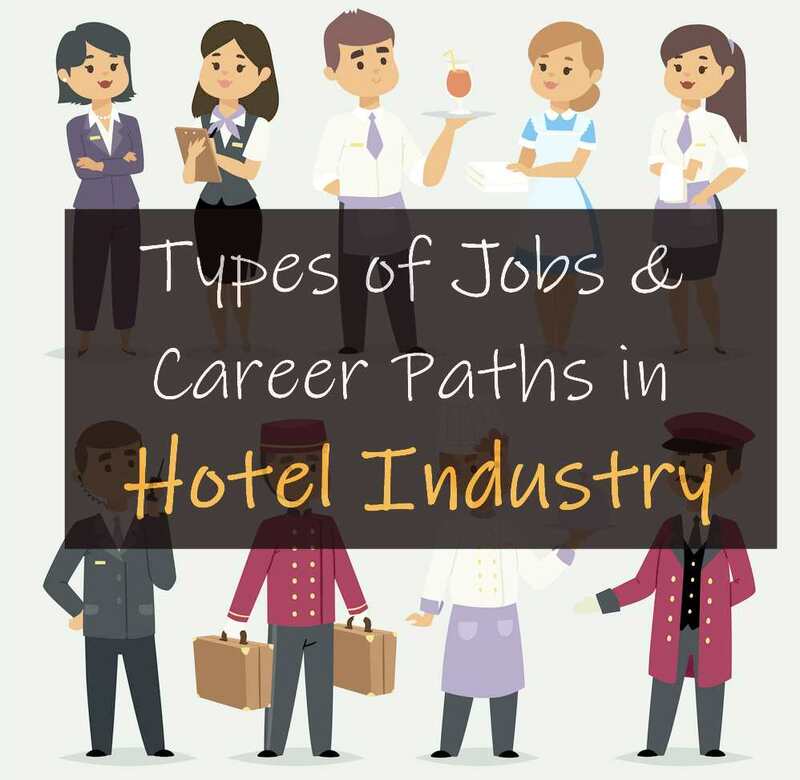 To make the post more interesting, we have included several interesting facts and tips about the career paths in the hospitality industry. And then there are various sub-sectors. So, in a nutshell, whether you are a hotelier, a Chef, a doctor, Information Technology specialist, Engineer, Technician, Gardener, Accountant or something else, we have got you covered here. If you are interested to know the salaries of these jobs, please also make way to our article that lists a few of the resources and salaries within the hotel industry. Although, the post takes examples of hotel management salary it is quite convenient to relate to other hospitality jobs. Let’s get on with the topic in hand now. As already mentioned there are various types of career that you can pursue within the hospitality industry. Did you know that the hospitality industry even has jobs like a Bedtime Storyteller and Dog surfing instructor? Amazing isn’t it? There are several other extremely unusual jobs in the hospitality industry. There are a lot of creative hospitality jobs as well like E-Commerce Managers, Creative Directors etc. In this section, we will cover the various types of jobs in the hospitality industry and in the next section, we will discuss career pathways to get to the top within the hospitality industry. Let’s get going then with various types of jobs in the hospitality industry. We have listed in another article some of the best paying hospitality jobs. This article covers a lot more about types of hospitality jobs. These are the jobs that pay the most and are the most difficult to get to. You would at least need to have a decade of experience to reach this level. According to an article at Chron, Top Executive earned a median of over $100,000 per year in 2016. 25% of them earned in excess of $160,000. Some of these are the Highest Paid Hospitality Jobs in the world. Do you think we named a bit too many here? We actually missed a few. 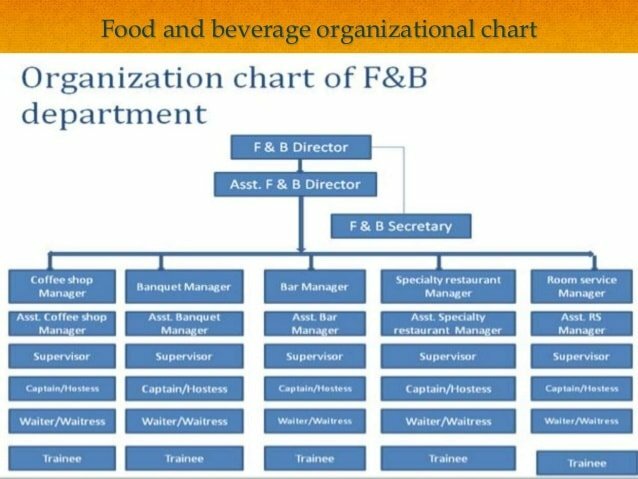 A typical full-scale restaurant within a hotel industry would have a rather complicated organisational chart. Have a look at the chart by Slideshare for better clarity. The chart is different for Cruise, Aviation sector and Entertainment industry but we have pretty much covered all major types of Food & Beverage jobs here. The kitchen is the mainstay of all hospitality organisations. We love various top cuisines in the world and Chefs make sure that our stay is memorable when we travel. Travel would not be as much fun without the variety of food that is on offer to satisfy our taste buds. This field is certainly one of the most popular career paths in the hospitality industry. There are a lot of top culinary schools in the world to ensure a regular supply of high-quality chefs. And, we can’t thanks them more. Here are a few of the types of hospitality career titles you can expect to have in the Food & Beverage Production department. The hierarchy of the Production department at a full-service hotel can be quite complicated. Below is a typical kitchen hierarchy of small hotel. If you want to explore hotel career options then Front Office can be a tempting option. They set the tone of service for the hospitality organisation. So, you need to have the best placed in these departments as they have a direct impact on maximum customer touch points in the hospitality industry. Few of the crucial types of Front Office and Reservation jobs include. and so on. We have of course missed a few but the above the major ones. The housekeeping department is said to be the biggest department in the Hotel industry and facility services. No discussion of hospitality career paths is complete without the mention of the housekeeping department. They ensure the cleanliness and beauty of the premises, rooms and common areas. Large hotels will have further subcategorisation of a lot of these roles while the smaller ones will find a lot of these job roles overlapping. Managing such a diverse workforce is one of the biggest challenges in the hotel industry. It is this department of the hospitality industry that is responsible to learn the art of hiring and retaining the best hospitality talent. Let’s list a few of the key people here. There are a lot of other categories within the Hospitality industry which are mentioned below. We will keep on expanding each of the below job roles in the future updates. Now it’s time for an astonishing fact about the hotel industry. There are over 15.5 million hotel rooms in the world and growing. Think of the opportunities for Sales Professionals. And, we have only discussed the hotel industry here. The Travel sector is huge as well along with Cruises and the entertainment industry. Yes, the opportunities are limitless. If you are a sales professional searching for a career path in the hospitality industry, you would probably be at one of these job posts. No this is not a mistake. Engineers are required in big numbers in the hospitality industry. Think of the infrastructure costs in the hotel industry and the food and beverage sector. Can you imagine the Aviation industry without Aircraft Maintenance Engineers? Cruise lines need so much of maintenance work. There is also a huge requirement of civil work in the hospitality industry. So, the jobs vary from top executive jobs to the basic repair and maintenance jobs. Cruise Ships have a somewhat different hierarchy. The below image by Saverocity gives us a bird’s eye view of the typical types of jobs in Cruise lines. Listed below are some of the types of jobs on Cruise lines. Career Path to a Hotel General Manager is depicted in the image below. You can expect to toil for a minimum of 10 years before you reach this stage. However, there are a few Hospitality Courses, Hospitality Management Institutes and Hospitality management certificates that should fast-track the process. Career Path to become an Executive Chef would be similar to culinary expertise and experience becoming paramount. A different and somewhat innovative Career Path has to be followed to become a Hospitality Consultant. There are numerous jobs in the hospitality industry. It is difficult to cover them all in one single post. We would try to cover maximum but we will still miss a few. That’s the expanse of the Hospitality and travel industry. Hope you found the list interesting of the types of jobs and career paths in the hospitality industry. We would be adding a lot more roles and details in future updates to make it a complete resource for hospitality job seekers. So, please keep coming back. And, do not forget to check our other blog posts for anything and everything about the hospitality industry.